Just in time for football season StarStreet, where traders buy stock and invest actual money in "shares" of professional athletes, has opened its first National Football League market after an invite-only test run in 2010. StarStreet also has a Major League Baseball market and plans to expand to the National Hockey League and National Basketball Association markets as their seasons begin. To start trading, you need to add at least $25 but no more than $500 to your account, although that ceiling will likely increase to $1K by Tuesday. For every person you refer who becomes a trader, you and that person receive $5. No person can own more than 20% of a player's stock. StarStreet makes 4% on the sell side of the trade and covers all PayPal fees. "If you think about it, there really has been no innovation in fantasy sports since they came online," CEO and founder Jeremy Levine tells LAUNCH via email. "They took what was offline, put it online, and now you get real-time stats, and NFL is advertising that they give you video -- so what?" The Cambridge, Mass.-based StarStreet is not the first to trade stock in people or ideas, but Jeremy boasts that it's the only one using real money for athlete "shares." Hollywood Stock Exchange, AthleteXchange and Empire Avenue all have similar market programs but operate with virtual currency. StarStreet is legal in the U.S. and Canada because it is a skill-based game, according to StarStreet. However, the laws in 11 states and a Canadian province are murky according to StarStreet's lawyers, so you can't participate if you live in any of them (Arizona, Iowa, Louisiana, Maryland, Montana, Vermont, Arkansas, Florida, New Mexico, Nebraska, South Carolina, and Quebec). Jeremy says he has had the idea for a sports market since he was a kid collecting sports cards in Cambridge. "Growing up I of course wanted to be on the front of those cards, but once I realized I had no shot at that (pretty early on), I decided I wanted to be the GM of a pro sports team," Jeremy says. "Quickly after that I decided I'd much rather take the Mark Cuban route there." More than 32M people play fantasy sports, an increase of more than 4M in the last two years, Jeremy says. But even with those substantial numbers, many are put off by the amount of hours and research it takes each week just to keep up with their own team. During the season, a player's performance generally determines what people are willing to pay for shares. StarStreet uses a bid-ask trading system. Traders can buy and sell players at any time by matching an offer from a fellow trader or naming their own price. Investors receive a payout at the end of the season. StarStreet is backed by TechStars, SV Angel, Jarrod Yuster and other angel investors who have not been disclosed. Which NFL player is Jeremy investing in? "For me it's Darren McFadden this year - I think he's going to kill it." Current player IPO listings are going up each day giving traders the opportunity to get in on the 100 shares of each player's stock from the beginning. The StarStreet dashboard shows you available player stocks with the option to buy or sell. 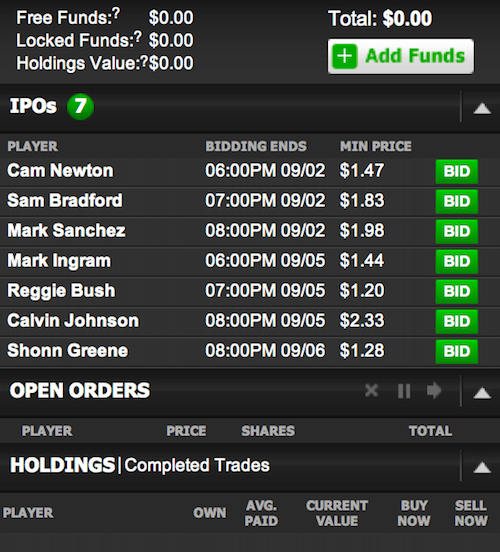 Clicking on a player's name will give you more information about their stock history and valuations. But before you can trade you need to deposit money into your StarStreet account, much like E*Trade. 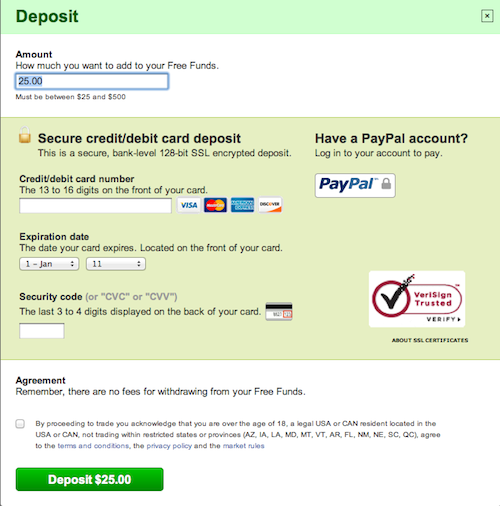 Upload money into your account, a minimum of $25 and a maximum of $500, with a credit card or PayPal.